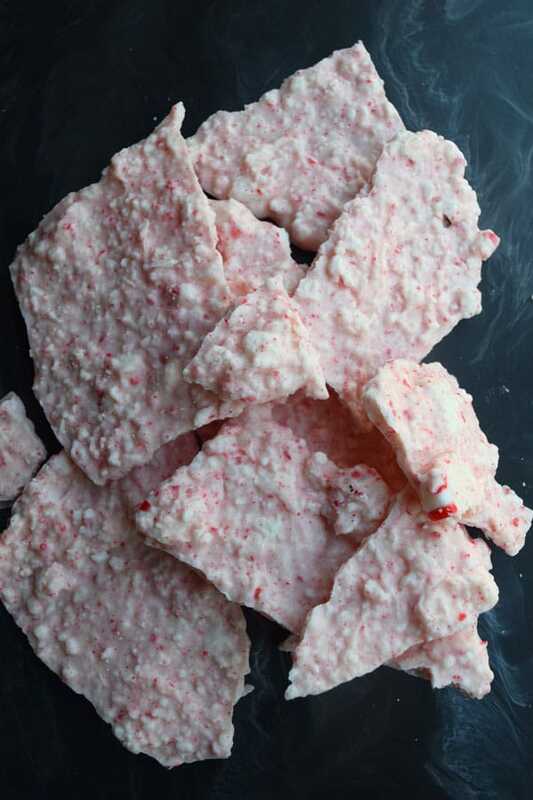 Easy peppermint bark recipe tastes like the best part of the holidays: peppermint and chocolate. Whether you use white or milk or dark chocolate matters not. Mint and chocolate are an unbeatable combination. But don’t wait for a holiday to make this candy. It’s delicious and so much better than store-bought, as most things in life are. You’re going to wonder why you’ve been buying tins of it at the candy shop when it’s so easy to make yourself. This candy recipe is even better because it’s so simple. Crush up 36 Starlight or regular off brand peppermint candies in your food processor and stir them into six ounces of melted chocolate. I make it easy and use chocolate disks. You can buy a 10-ounce bag of white or milk chocolate disks by Ghirardelli in your baking aisle for $4.99 or perhaps even less if you’re not in New England. What I really like about those disks, besides their deliciousness, is that they are super easy to melt in the microwave. When I made the white chocolate version of the easy peppermint bark recipe, I think it took less than 60 seconds to morph the disks all the way down into silky meltiness. Another good thing about this recipe is that you’re not messing around with peppermint extract, which is extremely strong. Many confectioners have ruined a recipe with just one drop too many of peppermint extract. If you want to be a Lazy Girl like me, keep a supply of paper bowls in stock so you don’t have to wash a dish after melting the chocolate. In fact, this candy recipe is nearly dish-free. Once you’ve used a spatula to mix the crushed peppermint and melted chocolate together, you spread the bark on a parchment paper or wax paper lined cookie sheet to firm up in the fridge or freezer. The food processor bowl will really just need a quick rinse to eliminate the peppermint dust. -Store bark in fridge and treat yourself to a piece after a workout ? What’s your favorite kind of bark? No fair saying tree bark. Name a candy! Crush peppermint candies in food process or by putting in a sturdy Ziploc baggie and running them over with your car. Melt chocolate in microwave in 10 to 15 second bursts, taking care to stir after each cycle. Chocolate burns easily. Stir crushed peppermint into bowl of chocolate until well-combined. Spread, using a spatula, onto a parchment or wax paper lined cookie sheet or jellyroll pan. Refrigerate or freeze until firm, about 30 minutes.